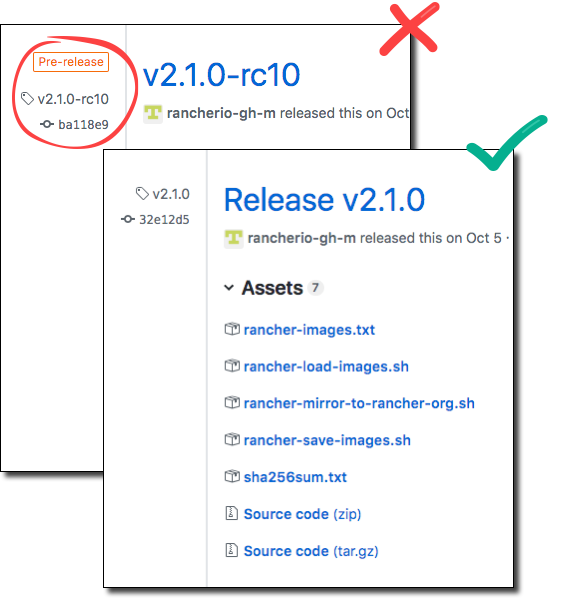 Using a computer with internet access, browse to our releases page and find the Rancher 2.x.x release that you want to install. Don’t download releases marked rc or Pre-release, as they are not stable for production environments. After collecting the release files, publish the images from rancher-images.txt to your private registry using the image scripts. From a system with internet access, use the rancher-save-images.sh with the rancher-images.txt image list to create a tarball of all the required images. Copy rancher-load-images.sh, rancher-images.txt and rancher-images.tar.gz files to the Linux host that you’ve provisioned by completing the substeps below. Log into your registry if required. Use rancher-load-images.sh to extract, tag and push the images to your private registry.